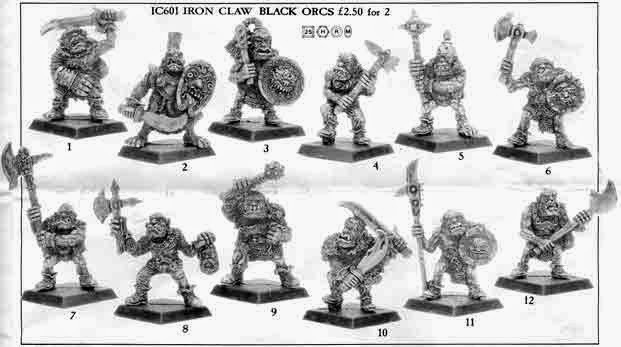 It has taken me 3 years and much treasure to collect all 12 of the original IC601 Black Orcs sculpted by Bob Olley and released by Iron Claw in 1988. Immediately upon receiving the last orc in the mail, I set to work painting them. From priming to final varnish, it took me one month. 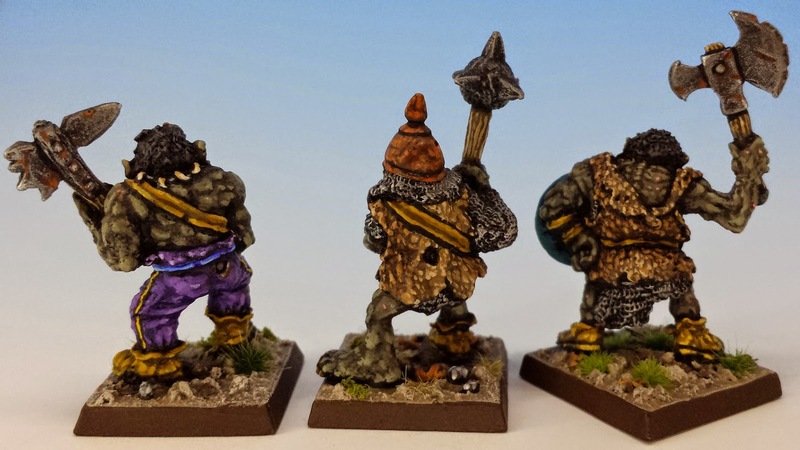 I was anxious to add some muscle to the anemic ranks of my small orc army, Krapfang's Backwood Bandits. 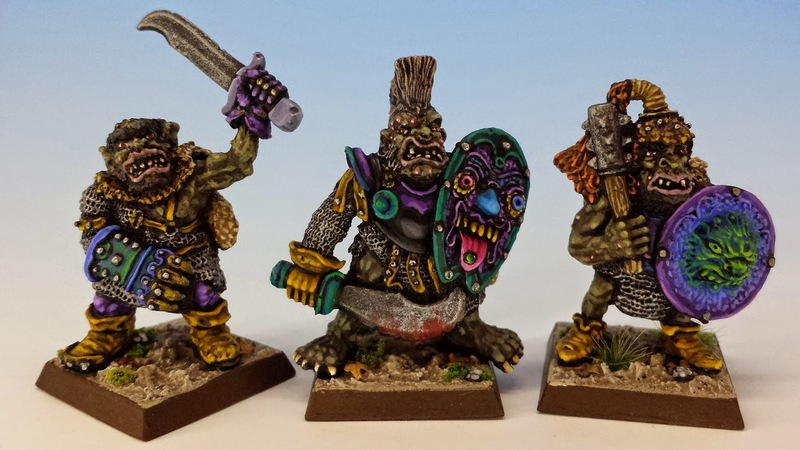 But more than that, I was looking forward to creating a colour scheme that would do these very odd miniatures justice. 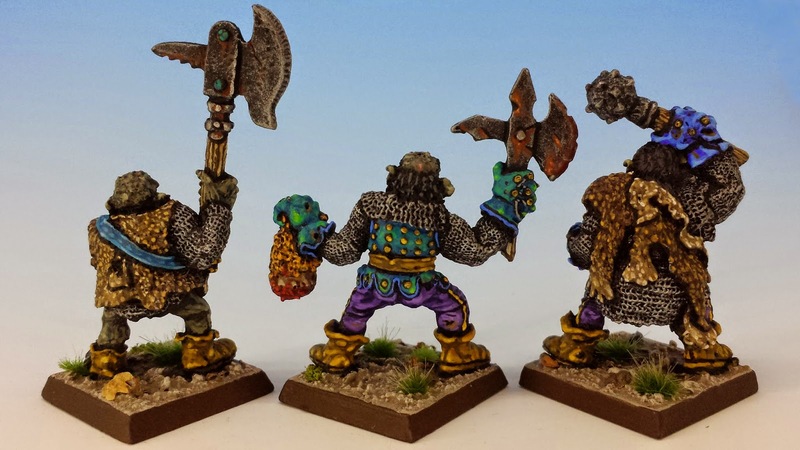 As I discussed last week, the virtue and vice of all Olley miniatures from the mid-1980's is that his sculptures rarely blend with other Warhammer miniatures. His figures are squat, swollen and big-headed. But they are also textured, bizarre and arresting. For my purposes, I relished the clash of styles. Black Orcs are supposed to be a separate race from their green-skinned cousins, so the strange, hairy physiognomy of Olley's figures would underline this biological fact. 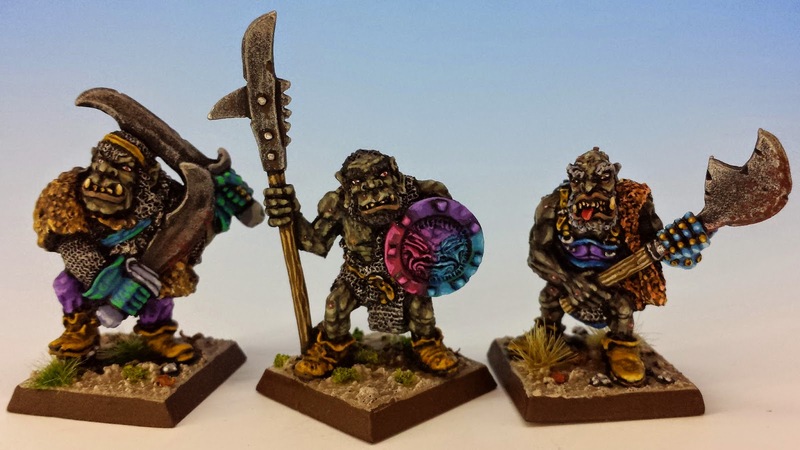 Indeed, I wanted my Black Orcs to stand out like super-beings from the rest of my army. I tried to make my painting as strange as the miniatures themselves. The organizing idea of my paint job was a juxtaposition between the dark skin and dirty furs on one hand -- and on the other hand, a tight pattern of ultraviolet colours for armour, shields and accents. The skin tone is Vallejo's "USA Olive Drab" with small additions of orange for lips, pink for pimples and pale green for other highlights. I tried (perhaps unsuccessfully) to keep the skin tones mellow. Meanwhile, the blues and purples were meant to give these villains the illusion of phosphorescence, like a glowing fungus in a cave. Painting a Bob Olley miniature is a constant process of discovery, as you notice new flourishes and artistry, especially around the face. I had a blast with their flabby lips, exposed gums, overbites, underbites and boils. At times, I felt like these models were painting themselves, since the highly textured surface would take highlights with very little effort -- I just had to let the brush find its own way across the surface of the skin and fur. From soup to nuts, they were a pleasure to paint. Thanks, Mr. Olley! 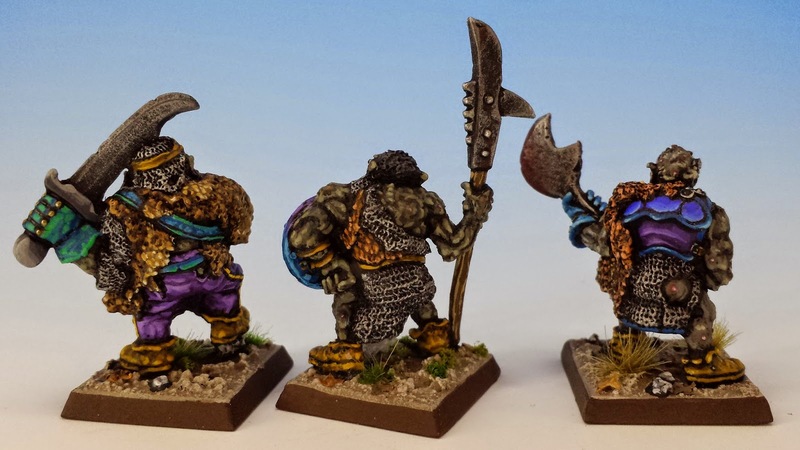 UPDATE March 2015: For another take on painting Bob Olley's Black orcs, check out Goblin Lee's superb, Tolkien-inspired set. Brilliant job, I love these mini's, I've got a unit of them myself. Yours are better! Thanks for the encouragement, T. Sauce and Colin! 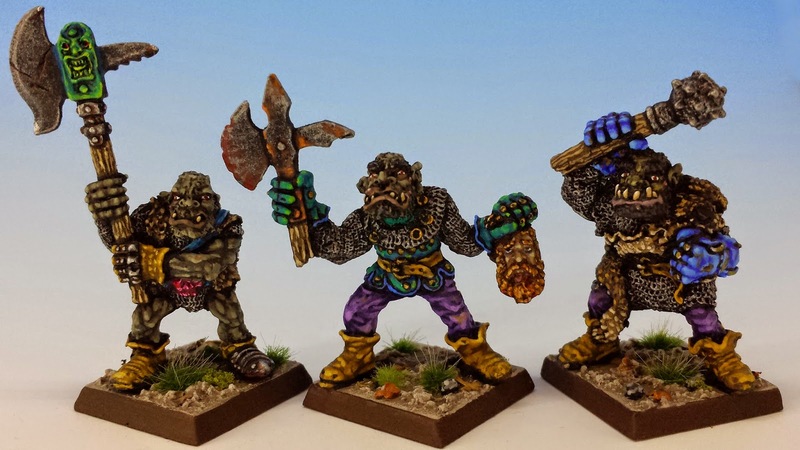 Colin - do you have pictures up of your Black Orcs? I'd love to see them. Colin, yours look grand. I love the red shield, and especially the banner. Nothing says "orcs" like a face with a gigantic tongue. I thought about bashing together a standard bearer and musician for my unit, but (for good or ill) decided to keep the minis pristine - like an archived copy of Olley's work. In any case, I wish your Black Orcs the best in coming battles! Superb job. I know Olley has his critics, but I love his style. Those are absolutely fantastic! I love the shield work and the skin tones are really magnificent. Stunning work, Mr Sullivan! I think you've absolutely achieved your aim of drab skin vs. luminous shields etc. They're lovely. And 24_Cigs: well, the wise folk say that the blood of Black orcs is the dark as night and thick as porridge. But you (and your ratters) will never see it! You raise a valid point. I don't think there is any blood in the charred remains of Warpfire shot. I guess that's why they call them black orcs. Sick burn, oh and a pun too! Warpfire? It will be like a sunburn for them! Amazing colour choice and dazzling application! 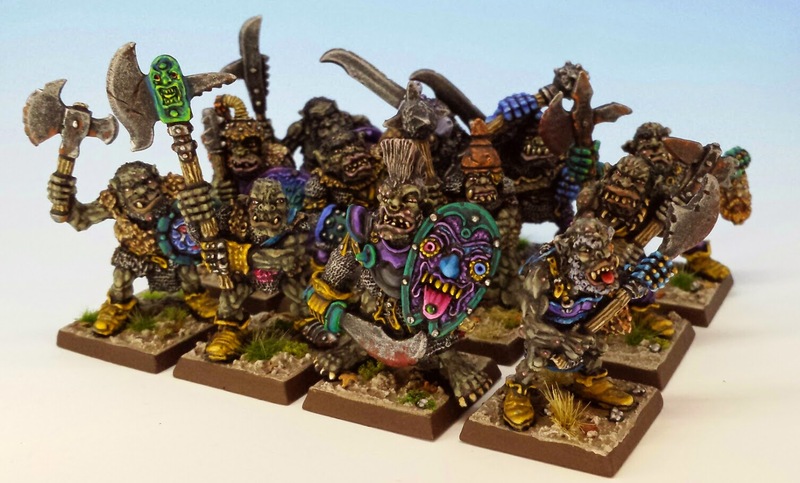 Any thoughts on including some of his fantastic Essex Orcs into your army? 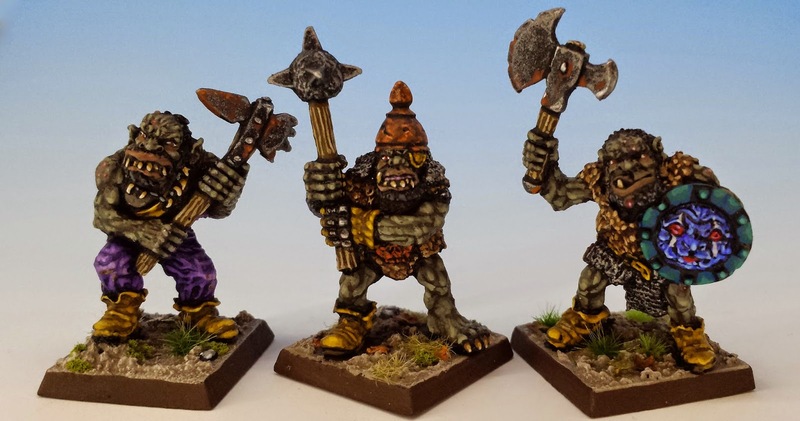 Those are great minis and your color scheme is beautiful! A fantastic unit! Love 'em!! Private W. -- I haven't had a lot of exposure to the Essex orcs, but the few that I have seen seem even more odd and Olleyish (Olleanic? Ollegian?) than Iron Claw -- I've seen longer legs on a claw-foot bathtub than on those Essex fellows. It might be too much of a good thing as far as I'm concerned. Really nice work collecting all these together and splendid paintjob. I love the contrast of the psychedelic colours with the drab flesh and furs. 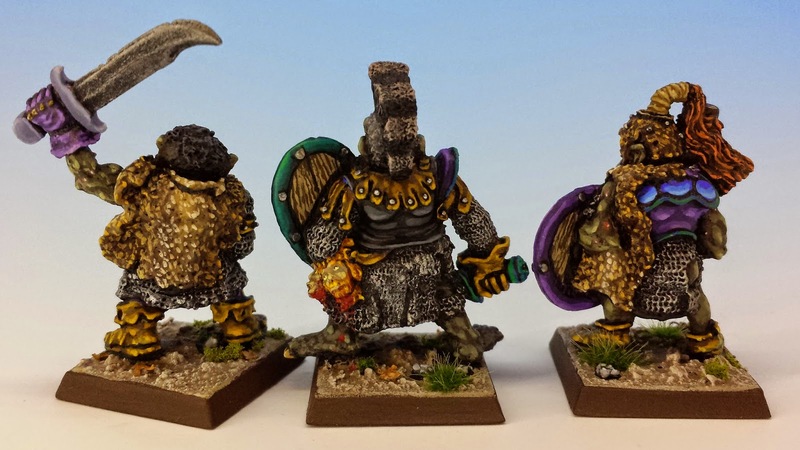 The artistry and talent of Bob Olley's sculpts is hard to do justice when painting but you certainly have.